It’s the Year of the Pig, according to the Chinese zodiac. In Chinese culture, pigs are a symbol of wealth and their chubby faces and big ears are signs of good fortune. But today, pigs have come to mean so much more. Most pigs don’t get a name, like Wilbur, Timon, or Miss Piggy. They get a number and live their lives under the yoke of industrial animal farming. This year, entire parades will be held in honor of an animal that lives and dies on factory farms by the billions. Pigs are special creatures that share distinct personality traits and behavior with humans. Despite what popular turns-of-phrase might lead you to believe, pigs are smart and clean–when they are given the opportunity to live a natural life. But inside factory farms, they lose their chance to live a natural life. Nearly 1.5 billion pigs are killed for food every year. They live their lives in horrible, overcrowded pens as if to hide their incredibly loyal, friendly, and playful personalities from the light of day. The Year of the Pig is just beginning. Let’s take a moment and consider the pig. Off the farm, we don’t hesitate to compare pigs to dogs. They’re incredibly friendly, loyal, and smart. Pigs are playful. They like to lie in the sun and sniff around the yard like everyone’s favorite furry companion. Pigs are social with other animals, but for the most part, they’re better off around other pigs because pigs are prey animals. Dogs, on the other hand, are predators. That being said, pigs are known to befriend dogs and cats in the home, as well as horses in a pasture setting. Mother pigs form especially strong bonds with their litters. They form social networks with other pigs, a level of non-human socialization associated most often with primates–but pigs know how to get to know each other, too. Pigs share a striking number of characteristics with humans. They like music and speak to each other in a series of oinks and grunts. Mother pigs are known to sing to their young while nursing. Just like puppies, baby pigs learn their names after just three weeks and respond to them. This can take up to seven months in newborn humans. Interestingly, pigs are close to humans in another unique characteristic. They “wear” mud much like humans wear clothes, primarily in order to shield themselves from the environment – mud regulates their body temperature, and blocks harmful radiation from the sun. Pigs, like humans, can otherwise get sunburn. Traditionally, many people would never go out of their way to call a pig clean, but in their natural habitat, pigs are very clean animals. They keep their sleeping area poop-free, that is, when they have enough space to do so. Sadly pigs, like most farm animals, lose almost all of their dignity the second they step foot on a factory farm. They go from kind, caring, intelligent beings to sloppy, smelly animals on their way to becoming food. This is no fault of theirs, of course. It is the industrial factory farming system that reduces them to that state and perpetuates the view that they have no value. Pigs also have the dubious honor of serving as a slur for people who behave in selfish, inconsiderate, and cruel ways. This is ironic when you consider the cruelty and selfishness that humans impose on pigs. There are many sayings featuring pigs that illustrate how poorly people consider these highly intelligent animals. “To put lipstick on a pig,” is one example. This usually means that you are trying in vain to make an ugly person pretty. In this case, we’re more concerned with the pig. We at Sentient Media would like to point out that this saying is totally backward and illogical. Pigs are beautiful creatures. Putting lipstick on a pig doesn’t make it any prettier. The saying should instead be taken to mean that you can’t beautify that which is already beautiful. In the U.S. alone, PETA estimates 121 million pigs are slaughtered every year. Since 1978, the number of pigs on industrial pig farms has ballooned to nearly 60 million animals, while smaller, family-run pig farms have become nearly obsolete. 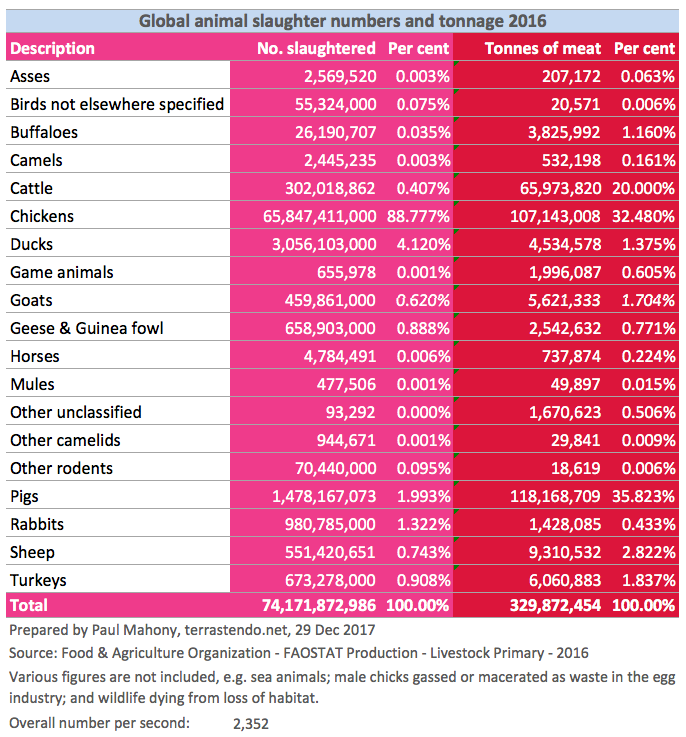 As of 2007, there were less than 1 million animals on farms of less than 100 animals in size. Plus, industrial pig farms were 20 times bigger in 2007 than they were in 1978, according to the Humane Society. More pigs on bigger farms have only made their lives worse. Farmers separate piglets from their mothers after 10 short days, while their mothers lie in crates so small they can’t even turn around, let alone roam freely. Factory farms strip pigs of their natural environment without regard to any social bonds the animal may have previously established with other pigs and, in turn, force the animals to live under nearly constant psychological stress. Between 5% and 35% of piglets die within the first three weeks on factory farms. Farmers crowd pigs into metal-barred pens with concrete floors, where they live–cold and afraid–until they’re about 100 pounds. Often, there are up to 30 animals in one pen. Mother pigs, called sows, give birth almost non-stop for up to four years before they’re slaughtered. This puts immense stress on their bodies and minds, never releasing the mother pig from the cycle of giving birth only to see her children taken away from her. The problem with overcrowding most cruelly manifests in transport to the slaughterhouse. Pigs grow to upwards of 300 pounds before farmers savagely herd them into the back of a truck and send them to slaughter. As many as 1 million pigs die every year on the way to slaughterhouses. Pigs freeze to death, suffer heat stroke, and suffocate in transit. Once you know how many pigs die on factory farms every day, it’s hard to forget. It’s even harder to forget the miserable, painful lives they live, especially when you see what it looks like. It’s harder still to get factory farms to go away. Part of the problem is that despite how much we hope for the best in other people, factory farms won’t simply disappear overnight. Celebrating the Year of the Pig means standing up for pigs ourselves. Cut out meat, join your local animal rights organization, share this story with someone that needs to know about the cruel mistreatment of pigs on factory farms. Give animals a voice!